If you are located outside the USA: We accept bank checks in US dollars, credit cards or Bank wire transfers. .You must be 18 years or older to buy our plans and kits. 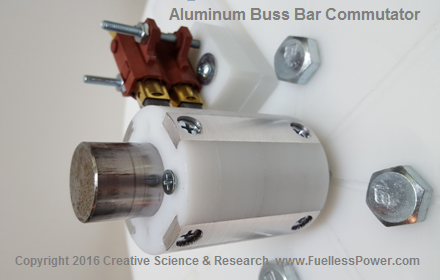 The Fuelless Engine is a free energy electric motor and generator. The free energy motor can also be used as a powerful AC or DC Generator to power a home! Our motor and generator is easy to scale up or down and can be made to output over 16 horsepower and more. FREE ENERGY - FREE ELECTRICITY - FREE POWER! Learn how to build this awesome free energy device right in the privacy of your own Backyard! With these easy to follow plans you can successfully duplicate the same test that we did as seen in the above video. We have also successfully turned the meter backwards! The plans are easy to follow and include many color step by step photos as well as drawings and instructions. We use UHMW Polyethylene plastic ( kitchen cutting board material ) for the outside and much of the inside of the device. Very easy and fun to work with! All you have to do is put it together! We also provide the part numbers of every nut and bolt and where to buy them as well as the special N52 magnets. Again we want to teach you to successfully do the same experiment and test that we did in the video you see above! After you put it all together please tell your friends about this website and help them as well! With these plans you can build both the motor and the SP500 AC Generator all in one housing or separately. The generator is rated up to 4,560 Watts. and can be wired to output 120 VAC, 220 VAC, 240 VAC or 400 VAC by 50Hz or 60Hz. The motor/ generator runs very quietly. And can be safe and easy to operate in any basement, garage or home. Motor runs cool to the touch! No other motor that size can do that! Does not pollute the environment! Is Green and Clean! This motor does not run on any type of gasoline, oil or any other combustible fuel. The free electrical energy produced by the motor is replaced back into the motor and reused by the motor. The rpm's are adjustable or can be built to run at one speed. Our plans are simple to follow. Many hours of research went into this device! They will not allow us to manufacture this device fully assembled. But, when you purchase these plans please notice that they are for your own personnel use! You can not manufacture them and sell them. This is the only way that we can share our free energy designs to the world. The more people we get building our free energy devices, the closer we get to a better and cleaner world! These plans will give you the confidence you need to successfully build this motor. If you have any questions after you study the plans, we do offer free technical support by E-mail. Plans are loaded with color photos, drawings and illustrations. Gauranteed To Work Or Your Money Back! This Generator/ Motor can also be started by using a 12 VDC car battery as well as a 9 volt battery. More energy output than input! 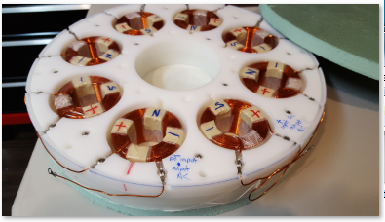 Inside the device we are using 16 powerful neodymium magnets as well as 8 specially designed air coils. The plans tell you where to buy all the parts and supplies. Low cost and easy to build! Free Energy Motor & Generator! This device is a motor as well as a generator! The motor is rated at about 16 Hp ( More horsepower can easily be added, up to 250 Hp! ) It is also known as our SP500 AC Generator. It can easily output at any of these desired voltages - 120V, 220V or 240V AC - 50 Hz or 60 Hz. Run your TV set, Computers, Lights, Tools, Sump pumps, and much, much more! 5KW - 10KW - 15KW Potential Energy! 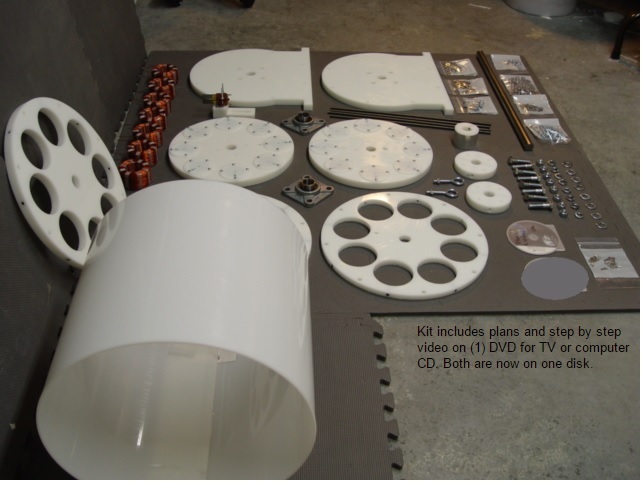 Notice: We sell step by step plans as well as kits! Gold Kit - 98% Assembled - $4,995.00 US Dollars - Plus shipping. Includes (8) specially designed generator / motor coils as well as (16) Large N52 rare earth magnets not shown in picture. The magnets can last up to 30 to 40 years before needing to be replaced.